Imagine being only 56 miles from Palm Beach, Florida, on a one-of-a-kind, serene, Bahamian Resort. Known for its spectacular oceanfront setting and luxurious accommodations, Old Bahama Bay was awarded the Four-Diamond Award by the American Automobile Association (AAA). The suite is an over-sized, junior suite (550 square feet+120 sq. ft. oceanfront balcony) with custom-designed furnishings, beachfront terrace, and fabulous ocean views. Availability is typically not a problem for at least 1 of our 3 suites. For that reason we do not display bookings on our rental calendar. Options for adjoining/connecting suite rentals can be discussed with owner. The Resort has been selling out completely, well in advance, for summer weekends and Holidays. Some holiday weekends may be blocked on the rental calendar. Return from a day on the beach to fresh seafood, served Bahamian-style, in the marina restaurant or the beachside tiki hut restaurant/bar just steps from the ocean. Old Bahama Bay is located on the very western tip of Grand Bahama Island and boasts miles of pristine beach and world-class snorkeling. Its 72 slip, state of the art, full-service marina offers night navigation with dockage for vessels up to 120 feet. 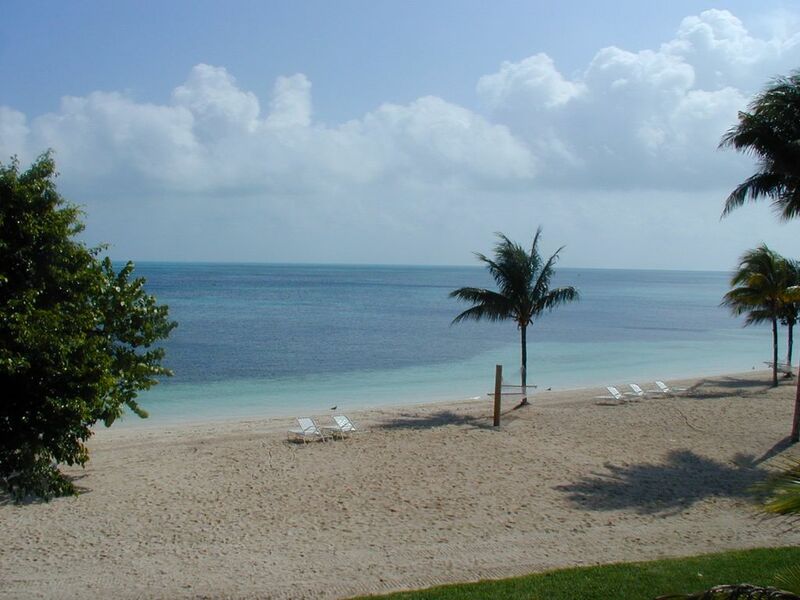 Our luxury beach cottage suite is located in one of twelve Bahamian-style buildings, each with six suites facing the Atlantic Ocean and about 40 ft. from the beach. I’m sitting in the shade of a coconut palm on Old Bahama Bay’s white sand beach. I have a lot on my mind. Like when will the tide force me to move my chair? And when will hunger finally compel me to walk 100 feet to get that hamburger in paradise? A yacht cruises into view. I can see the bow and then slowly the rest of the behemoth as it turns. I wonder who’s on this big girl. The hamburger can wait. Tiger Woods has dropped by Old Bahama Bay resort several times on his 155-foot yacht Privacy, so maybe it’s him. Katerina Graham of The Vampire Diaries stayed here recently. And Kesha filmed her TV show here in July. . . Could be interesting. Only about 80 nautical miles across the Gulf Stream from Miami and 55 from Palm Beach, this elegant compound including an inn and villas is strung along a beach on the western tip of Grand Bahama Island near the fishing village of West End. Most people arrive by boat — yachts, fishing boats and sailboats. The 72-slip marina is a port of entry and many boaters pass through, some just stopping for a dinner of cracked conch or lobster at Old Bahama Bay Dockside Bar & Grill. Or a cheeseburger and conch fritters at the beachside Teaser’s Tiki Bar. The inn’s 67 luxury junior suites and six spacious two-bedroom suits are in two-story Bahamian-style buildings with terraces and balconies overlooking a gorgeous white-sand beach. My room is sophisticated Caribbean-style with dark wood furnishings, wicker on the terrace, and plantation shutters thrown open to ocean breezes. The inn has a new dive shop, but bonefishing and offshore fishing trips remain the top attractions. And there are enough beach toys to keep me busy for a week — sailfish, Hobie Cats, kayaks, bicycles, and snorkeling gear. All linens provided, including beach towels (provided at the beach hut without charge). Shared in the marina area. World-Class Snorkeling & Scuba Diving, Nature Trails, Marina, Beach or In-Room Massage, Bonefishing, Deep Sea Fishing. Snorkeling, Sunset, and Picnic Boat Trips. Tennis, Horseshoes, Volleyball, Shuffleboard, Basketball, Ping Pong, Pool Table, Kids Activities Programs.